Split is a dynamic, bustling city on the green peninsula of Croatia. With a population of 178,102 residents, it is the second-largest city in the country. Split offers a miraculous chance to experience turquoise-water backdrops and breath-taking mountain views! Popular attractions include Marjan Hill, Diocletian’s Palace, Bacvice Beach, Poljud Stadium and the Green Market. Cheap flights to Split are now available for a limited period of time, so get ready to explore this adventure filled city! Split is the home of Split International Airport (SPU), which is a 40-minute drive from the city centre. For wine lovers and social butterflies, Croatia’s best bar crawl is hosted at The Diocletian’s Palace. Discover secret alleyways, and experience this ethereal seafront ruin. 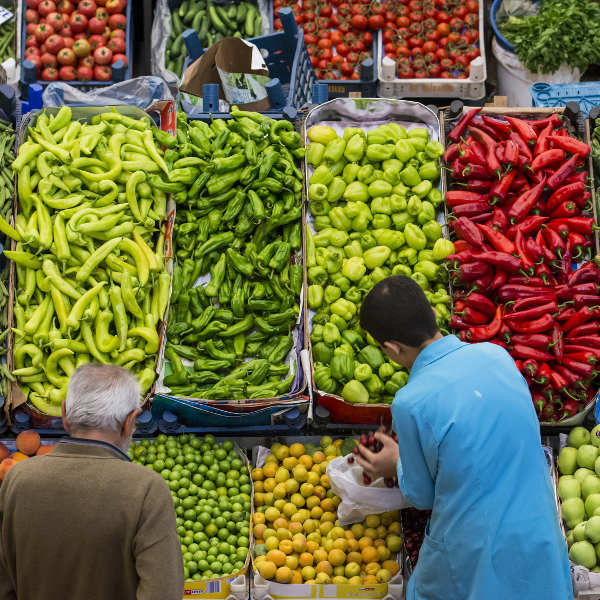 The 24-hour bustling market is home to local stallholders. Indulge in flavoursome fruits and vegetables and listen to stories from age-old vendors amidst the roaring buzz of trade. 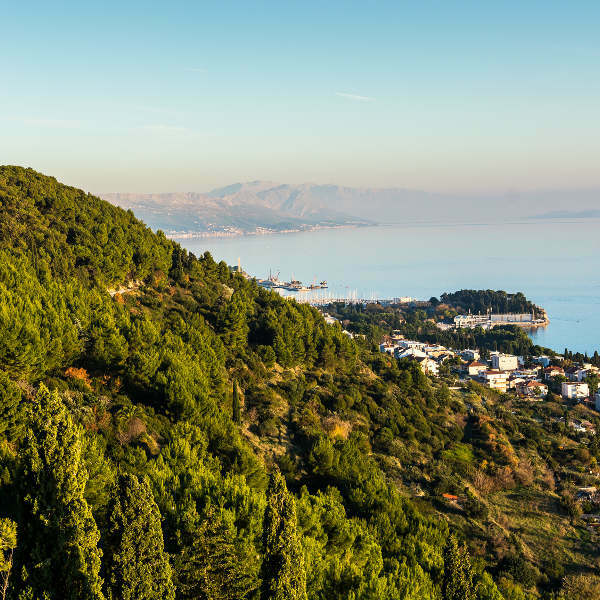 This nature reserve is bursting with fragrant Mediterranean pinewoods. Marjan is a mind-altering forested hill that affords views over the sea, to the islands of Brač, Šolta, and Čiovo. Split experiences decadently mild weather throughout the year. Split does experience snow during winter (December to February), but not that often. Temperatures in summer (June to September) can reach the mid-30s. The best time to visit is during the months of May and June, and September and October. Visitors can expect sunny days without the crowds. The weather is ideal for outdoor activities such as hiking and cycling. Dalmatia’s largest city offers a multitude of treasures. Previously used as a point on the transit routes, toward the islands, Split now manages to intrigue passer-by's, making the city their final destination. Along its narrow streets, Split dazzles you with lovely boutiques, restaurants and galleries. Dalmatian lifestyle consumes the atmosphere, where visitors are able to learn about the city’s history and absorb contemporary designs. The Riva (seafront promenade) is one of Europe’s finest gems. Pleasant views can be enjoyed on a balcony at a local café. Split’s roots lead to the Diocletian Palace. 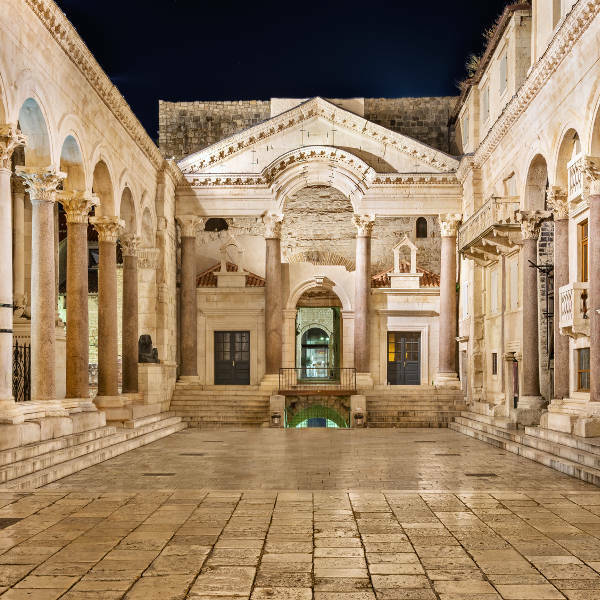 The Roman Emperor, Diocletian, chose this spot in Split to build his luxurious retirement palace in AD 925. It is a unique mix of architecture, which is found in a labyrinth of exciting narrow streets. Today, the Diocletian Palace can be accessed by all. A walking tour of the palace offers a chance to see the underground cellars, Peristyle Square and Cathedral of St Duje. Compare several airlines and book your cheap flights to Split online at Travelstart! Croatia is considered the safest European destination you can visit. However, it is wise to be cautious in any new city in which you find yourself in and it is wise to invest in travel insurance before visiting the city. Once in the city, tourists should use sunscreen with a SPF of at least 15 and wear protective clothing to avoid sunburn. Use sidewalks and marked crosswalks and pay attention to the traffic around you, especially in crowded areas.Keep an eye on your valuables at all times and avoid wandering around with large sums of cash and important documents, as pick-pockets and bag snatchers operate near museums and beaches. Avoid any political discussions in public places, as locals still have strong opinions about regional issues. Tourists do not require any mandatory vaccinations to enter Croatia. However, all travellers are encouraged to do routine vaccinations before travelling to any destination. These vaccines include measles-mumps-rubella (MMR) vaccine, diphtheria-tetanus-pertussis vaccine, varicella (chickenpox) vaccine, polio vaccine, and yearly flu shot. A vaccination for hepatitis A is also recommended for most travellers.